'Arena Kalyves beach' is the ideal lovely duplex apartment location. 30 minutes from Chania Airport. Where can you find beach front apartments and of this standard? - only here! Whether you want to unwind and relax on the beach or enjoy the traditional everyday living of being in a real Cretan Village, Kalyves is for you. A selection of good tavernas both fish and traditional lamb and pork dishes are available. The Cretans really are very friendly and welcoming. You are assured of a wonderful welcome. The historic Venitian City of Chania is merely a 20 min drive or bus drive away. It is a shopper’s paradise with markets, walkways and harbour. Further in land experience traditional Cretan Villages. There is so much to see in this area you will want to come back. John and Christine Warwick. He is British, she is French/Italian. We both fell in love with Crete, the island, the weather, the locals and their Cretan hospitality. We had visited many other European Countries but never felt as comfortable and at ease as in this part of Western Crete. We had been looking for somewhere to buy and to share with our friends and extended family so when the opportunity arose we had no hesitation. We want our visitors to share the enjoyment we have experienced in this part of Crete and will endeavour to give you as much information as possible to ensure you a wonderful holiday. Regarding Crete, I fell in love with the island the first time I came to visit and this triggered our desire to buy a property there. I am myself Italian and French and Crete reminded me of both Cote d'Azur and Toscana before these places were spoiled to some extent by overbuilding and mass tourism. Western Crete is considered the most traditional part of Crete. We are at easy reach from the wonderful old Venetian town of Chania (La Canea) as well as Rethymno with its Turkish legacy. Our apartment is modern and well equipped and YES right on the beach with direct access to the beach through the 16 apartment complex. Taverna 2 minutes away, Supermarket opposite. Location, location, location ! The apartment benefits from a sea view and an access from the communal area direct to the beach. This means no road to cross to get your feet into the sand and you will almost feel like you are in a private beach with golden and fine sand. You will enjoy having your meal on the balcony with view on the sea unless you prefer to indulge yourself in one of the many local taverns within walking distance. Indeed you don’t need a car to stay in our apartment since all the amenities are within easy reach and yet the property is still remote enough from the core of Kalyves to ensure a peaceful stay. The bus stop to Chania, Rethymno and Heraklion is near by. Chania is just at 20 minutes and should you want to have a night out in its old buoyant Venetian harbour, a taxi is easily organised. Bathroom 1 with shower. Bathroom 2 with bath. Both incorporating wc's and wash hand basins. In the two bedrooms. Free. Included in the rental price. Free parking just at the property entrance. Lounge with magnificent sea and beach views. TV/DVD/Satellite. Double bed settee, seating, table chairs and outside balcony furniture. Everything you need for cooking substantial meals that feed the whole family. table in the kitchen area can be extended. Actually people prefer to eat outside, on the balcony, facing the sea. The property is split into 2 levels. Outside: 4 outside balcony areas. With seating and tables. Al fresco dining from the lounge balcony with excellent sea views. Loungers available. Utility Room: Washing machine, iron and ironing board are supplied within the apartment. Cleaning / Towels / Linen / Maid service: Towels and bedding are provided. Please bring your own beach towels. Other: Air conditioning in both bedrooms. Sunbeds for use on the beach. cot bed, high chair and children stairs security gate on demand. The apartment was very comfortable and modern. Perfect for a relaxing holiday and has its own sandy beach. Local restaurants close by and supermarket opposite. We hired a car with Christine’s recommendation as we wanted to explore the area a little but really you could easily spend your time in the village and the other local beaches which are all within walking distance. I would definitely recommend the apartment and this location. It is perfect. Well located within walking distance of Kalives village. Great to have direct access to a lovely beach. Appartment is light and spacious and we very much enjoyed our stay in this interesting part of Crete. Thanks Vivienne for your feedback. We are so happy you enjoyed your stay. We look forward to your next stay and exploring more of this wonderful part of Crete. We liked the location; the little town of Kalyves; we liked Crete very much ! the appartement need some maintenance; shower downstair (tap) ; shower upstair no curtain; the kitchen tap (splash everwhere) the cleanliness in general was so so. No climatisation upstair . Thank you for your review and we are happy you enjoyed your stay. We always strive to provide the highest standards and welcome comments that help us maintain these standards. I would therefore like to respond to your comments. The high water pressure you mention (‘taps splash everywhere’) was in fact a temporary issue affecting the whole village which was soon rectified by the Crete water board. We are sure you would agree that was beyond our control. The bathroom upstairs you mention, has a bath and the shower head is provided only for washing hair. It is not meant for showering and therefore no curtain is provided. The downstairs bathroom has a dedicated shower cubicle with curtain. Apologies for any misunderstanding. You mentioned the ‘so so cleanliness of the apartment’ We are really disappointed by that. Although I wish you had brought that to the attention of our manager soon after your arrival and she would certainly have inspected and sent the cleaner back to ensure the apartment meets the standards we expect. Your comment about the lack of an aircon unit upstairs in the lounge is something that we have now resolved. Previous guests over the years have fed back to us that they preferred a fan rather than air con and therefore this last season we took out the unit. In the very hot weather and at the height of the season we now feel air conditioning is preferable. So we have now reinstalled an air con unit. Some issues that the owner was responsive to (peak of summer extreme heat caused upstairs to become uninhabital for a few days, but we purchased a fan which mostly fixed the issue and the owner said she will come up with a future solution (we also left the fan there and you can use it to bring air in from the ocean side and across to the kitchen). The place was an ideal location with a very nice beach (the property is beachfront, but set back behind the fromt properties) and it has a nice view of the beach from the upper balcony. Definite authentic Greek/Crete community! Thank you for your helpful comment regarding the lack of an air con unit upstairs. We have now installed one. You were perfect guests and we hope you will stay with us again in this lovely typical Cretan sea side village. We had a great holiday. The apartment is modern and well equipped. So convenient for the beach, 2 mins away. Even sun beds are provided. All amenities are within walking distance, supermarket opposite the apartment, and a variety of other shops, mini markets, cash machines, bakery, etc in the centre of the Village. Excellent selection of tavernas , all serving excellent Greek cuisine. We will return !! Actually now booking for 2019 ! The property is a good size and has pretty much everything you need . For four adults to stay there in more comfort it would benefit from another comfortable chair in the lounge. The bedding really needs upgrading. The pillows in particular need changing some are like bags of cotton wool. The smaller bedroom has a very hard mattress . The tap controls are difficult to get the water temperature just right . Saying all that we had a great holiday . The setting is great . Great parking and very handy that the supermarket is just across the road . It’s a lovely walk into Kalyves along the sea front . We had hired a car and we were out all over the top of the island. We had a great meal In Kissamos and we loved Rethymno. We absolutely loved Stavros and visited there twice . The secluded bay lovely and just round the bay a bit a fabulous French/Greek / Arabic beach taverna run by a lovely French lady . The owners of the apartment were very helpful . So overall we had a great stay and will visit again one day . Thanks for your review mentioning areas of improvement. As you have quite rightly established, we have 2 types of pillows which are changed every season. One type of pillow is medium firm and quite thick whereas the second type is much thinner and filled with cotton balls that allow air to circulate hence keeping your head cooler during the hot summer period. This lighter pillow is used on top of the heavier more dense pillow. We do not provide any feather type pillows because they are allergen. We allocate 2 pillows per guest , one classic and the thinner one. Obviously since you came early April you would not have needed the lighter pillow on top. Perhaps we should add this information in our accommodation handbook to avoid this misunderstanding in future. In regard to your comments about the hard mattress. They are of course of a Greek standard and are well renowned for being somewhat firmer than the British manufacturing standard. This is also due to thermo conditions being very different in Crete than in UK. However we are sorry you felt the bed to be too firm. Your review has prompted us to order a latex topper. This topper will not affect the overall bed support but will make it much softer for our future clients. Thank you for your comments which are appreciated in helping us reach the highest customer satisfaction possible. 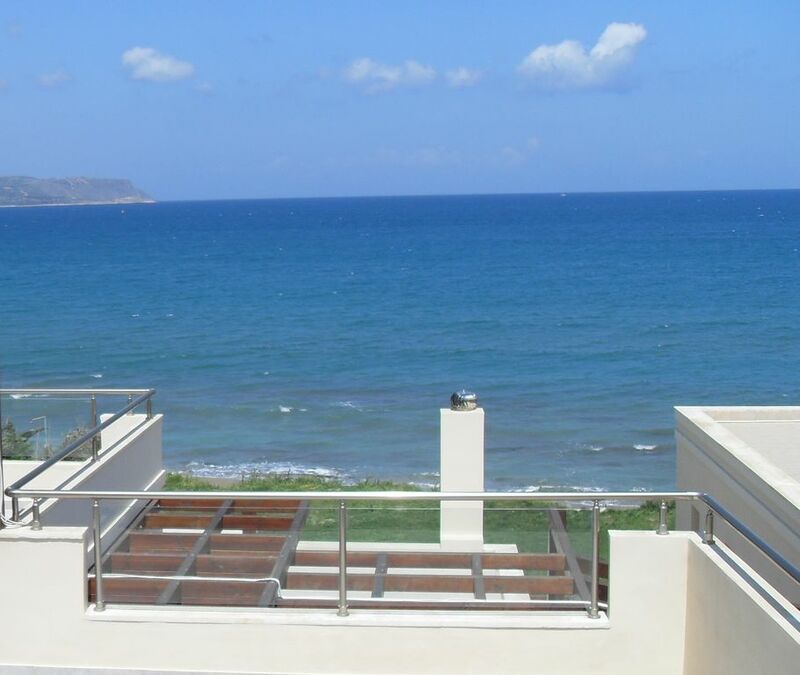 We are happy to hear you had a great stay at our apartment in lovely western Crete. On the beach! The little private residence has its own entry to the beach. Chania Airport 30 mins. Heraklion Airport 90 mins. Car hire contacts available. Car not essential if you want to experience typical Cretan village life and a beach holiday. Flights with Easyjet, Ryanair, Monarch, Thomsonfly. 5 minutes walk to the centre of Kalives village. Souda port 15 mins drive. Lake Kournas 35 mins drive. Almirida beach 10 mins drive. Souda Allied War Cemetry 20 mins drive. Supermarket opposite the apartment. Excellent range of Taverna's 1 min away and in the village centre. Lots of local shops to meet your everyday needs and a range of tourist shops. Booking Notes: Contact us if you prefer a monthly scheduled payment option (more than 3 payments).